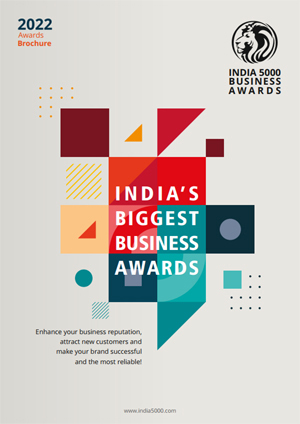 INDIA 5000 is a research group and as a part of the Benchmark Trust, INDIA 500 0Business Awards focus on the knowledge extraction from MSME and young entrepreneurs to India’s best 5000 list with INDIA 5000 female awards. INDIA 5000 provides one-click solution to the end users who want to get the list of best MSME on the search space, besides MSME business owners and entrepreneurs who believe in quality output in their products, services or management can get the best platform. What is the Concept behind INDIA 5000 Business Awards? INDIA 5000 is a concept where you can get integration of India’s best 5000 MSME and Entrepreneurs. Till now, you have to find this type of research from media, press release, magazines or web research but INDIA 5000 Business Awards is for Micro, Small and Medium Enterprises which are doing quality work in products, services and management. They get platform for professional growth however, they don’t believe in more revenue and also end users easily get this list. If you don’t know whether your firm comes under MSME or not, INDIA 5000 can help you in finding a solution. According to the INDIA 5000 Business Awards, if your business enterprise is engaged with production and your turnover in plant or machineries is not over Rs. 5 Crores then it comes under the Micro Enterprise. If it’s more than Rs. 5 Crores and less than Rs. 150 Crores then it comes under the Small Enterprise. If the investment is more than Rs. 150 Crores and less than Rs. 500 Crores then it falls under the Medium Enterprise. Note: These guidelines are as per INDIA 5000 Business Awards. The MSME guidelines of The Government of India may differ.